Properties in Pontecuti average 4.8 out of 5 stars. 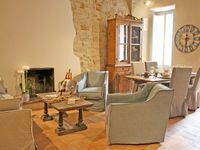 Old historic apartment in the medieval village of Todi. 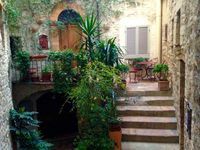 Property 14: Old historic apartment in the medieval village of Todi. Charming Country-House, garden, natural pool, horses. Time to rest near Toscana - Guesthouse "CRISTALLO"
Property 26: Charming Country-House, garden, natural pool, horses. Time to rest near Toscana - Guesthouse "CRISTALLO"
This medieval castle in Umbria dates from the 13th century. Property 35: This medieval castle in Umbria dates from the 13th century. Castello Izzalini Todi Resort "Apt 12"
Property 42: Castello Izzalini Todi Resort "Apt 12"
A tous ceux qui veulent visiter l'Italie sans se fatiguer, voil&agrave; l'endroit id&eacute;al! La maison est parfaite, il n'y manque rien, la r&eacute;novation y est exemplaire. Quant &agrave; la situation, elle ne peut &ecirc;tre meilleure puisque l'entr&eacute;e est &eacute;loign&eacute;e de la rue peu passante, par contre on est &agrave; deux pas de la piazza del Popolo. Les march&eacute;s d'alimentation sont faciles d'acc&egrave;s puisque le service de bus de Todi est tr&egrave;s efficace. A visiter et vivre absolument chez Paola! From the first communication with the owners and the local property manager everything was perfect. We loved our stay in the medieval building with all the comforts of the 21st century now added. The bed was super comfortable, kitchen well equipped with dish washer and clothes washer and there was plenty of room to relax in comfortable arm chairs by the fire if the weather warranted it. I particularly loved the shower with decent water pressure, something you don&rsquo;t get too often. Todi itself is charming and a good base to explore the rest of Umbria. We were sorry to leave when our week ended.